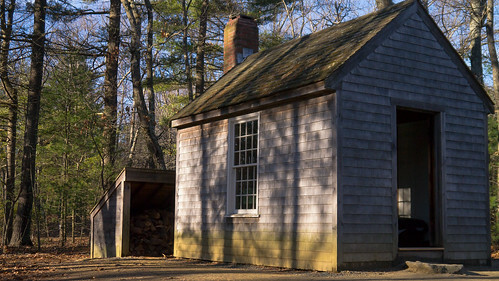 Thoreau built one near Walden Pond. Uncle Tom was sold into slavery from one. And I have spent many a happy week in one perched high above the rim of Zion National Park. It is of course the classic American Cabin. The cabin is synonymous for me with the American dream. Getting back to nature in a simple structure set in some beautiful place. What’s not to like about that? If you care about conservation of our natural environment a lot, unless its approached very carefully. According to recent census estimates reported by HomeInsight, nearly 6% of American’s own a second home — mostly within 150 miles of their prime residence and often in the mountains, near the beach, or in some other natural setting where recreational opportunities abound. And while Thoreau’s cabin was little more than a one-room shack with a porch, second home size has ballooned and now regularly approach (or even exceed) the size of people’s primary residence. To put it in perspective, America has the largest average home size in the world, at 2,300 square feet compared to 820 square feet in the UK, according to a report by the BBC. In other words, we’re building more and more large homes in rural areas at low density. While some get rented out and see a lot of use, that’s a lot of homes dotted through our countryside that get scant use. The impact of rural residential sprawl on the natural habitat of the surrounding area has not been well studied but includes impacts on wildlife, water quality, air quality, and increased risk of fire. That’s why it was gratifying to read that the ill-conceived Preservation Ranch project in the coastal forests of Sonoma County, California, has finally come to an end. This proposal to convert a 19,640 acre forested area into 60 trophy “vineyard homes” has been been replaced with a conservation plan that maintains it as working forest while removing the threat of development and opening it up for public access. In a deal pieced together by the Conservation Fund, the State Coastal Conservancy, Sonoma County Agricultural Preservation and Open Space District and the Sonoma Land Trust with the assistance of the Gordon and Betty Moore Foundation have ensured the future of this land. The land will be owned by the Conservation Fund, subject to a conservation easement to be held by the Open Space District and adds to the conservation lands already protected by the Conservation Fund to the north. This deal used $10 million on state bond funds and $4m in county open space funds, along with private support from the Conservation Fund and Moore Foundation. That’s a lot of money. One crazy aspect of the project is the money behind the ill-conceived development was CalPERS funds — that’s California State retirement funds managed for public sector workers. In other words, we are using state bond funds to buy out a state pension fund. It would be nice if the state’s investment arm talked to the Resource Agency before making investments working counter to state policy and goals to protect wildlife and forests. Is that too much to ask? And one more thing, in a time of budget cuts and a debate over tax reform in Washington, recall that mortgages on second homes are eligible for tax relief. It is estimated that this deduction will cost the government over $100 billion this year — assuming 3% of that is due to second homes (an estimated from 2000) that is is a $3 billion subsidy to promote rural sprawl. If you’re a renter it can be tough to understand why you should get a tax-break for borrowing money to purchase a first home. But come on, why extend that break to second homes? It makes no sense what so ever — either from a social justice perspective OR a conservation perspective. It’s one tax “loop hole” that could be closed with unexpected conservation consequences.